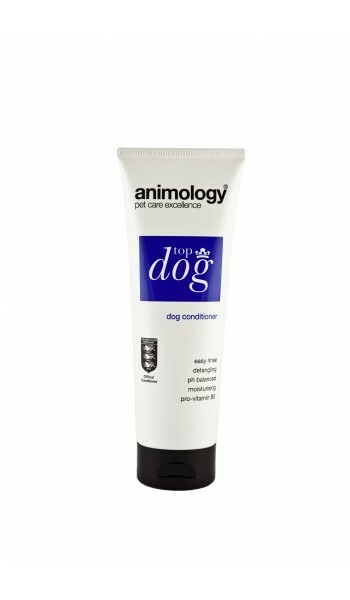 Animology Top Dog is a vitamin enriched conditioner that detangles and replenishes moisture for a soft, shiny and healthy coat. Animology dogs body is suitable for all types of dog coat. It has a mild yet deep cleaning action that removes dirt and odour and is infused with our 'Signature' scent. 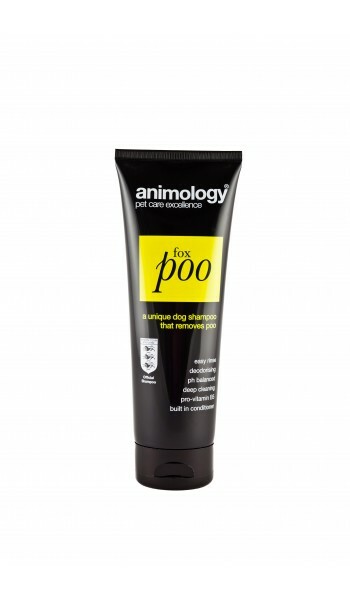 Animology Fox Poo is a unique and exceptionally effective shampoo that successfully removes stubborn fox poo, and its foul odour, from a dog's coat. Back to Black by Animology is a vitamin and conditioner enriched shampoo that will help enhance the colour and radiance of your black dog for along lasting healthy high gloss shine. 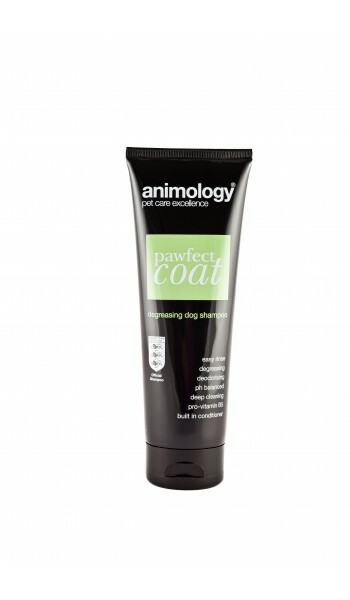 Animology Pawfect Coat is a degreasing shampoo that cuts through a greasy coat leaving it silky, healthy, and beautifully clean. 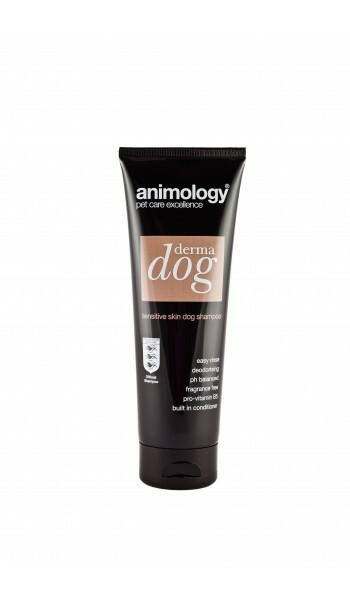 Animology Derma Dog is a fragrance free shampoo specifically formulated for dogs with sensitive skin with added vitamins and conditioners to leave a dog's coat clean, soft and healthy. 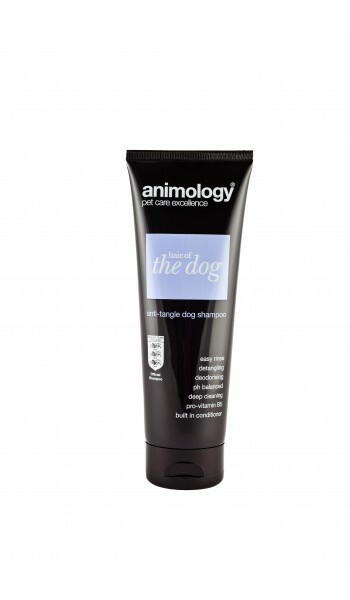 Animology Hair of the Dog is an anti-tangle shampoo that removes knots and tangles from a dog's coat, leaving it silky, healthy, and free of tangles. Animology Mucky Pup no-rinse shampoo is suitable for puppies from the age of 6 weeks old. It can also be used as an everyday dog no-rinse shampoo and is infused with our 'Baby' scent. 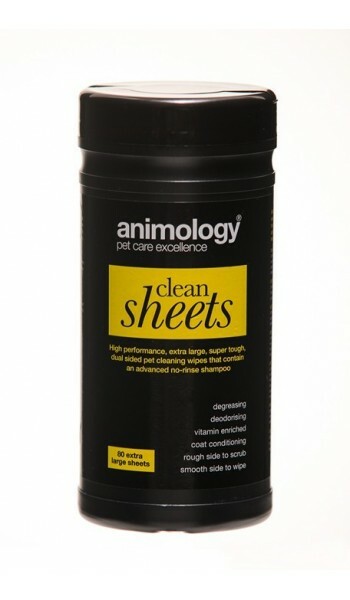 Animology Dirty Dawg no-rinse shampoo is suitable for all types of dog coat. It has a mild yet deep cleaning action that removes dirt and odour and is infused with our 'Signature' scent. Animology Puppy Fresh deoderizing spray is a vitamin enriched spray suitable for puppies from the age of 6 weeks old to keep them smelling fresh and fragrant. Infused with our 'Baby' scent. Animology Stink Bomb deoderizing spray is suitable for all types of dog coat and keeps them smelling fresh and in great condition. Infused with our 'Signature' scent. 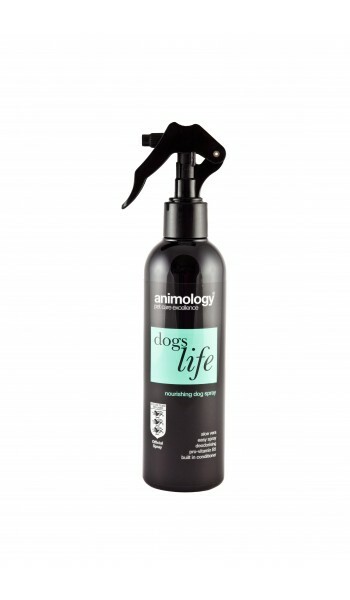 Animology Dogs Life is a nourishing spray enriched with vitamins, aloe vera and conditioners that help keep a dog's coat looking and feeling clean, healthy, and full of life. Animology Paws & Relax is an aromatherapy spray containing soothing lavender and chamomile to help calm and relax anxious and nervous dogs and keep your dog's coat fresh, clean and healthy between washes. 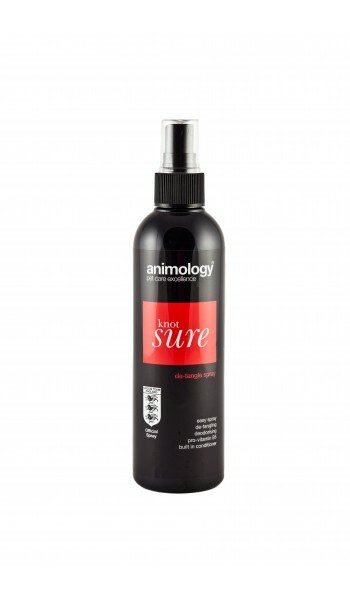 Animology Knot Sure anti-tangle spray effectively removes knots and tangles from a dog's coat. Used regularly, Knot Sure can be used to prevent further matting. Animology Gloss Finish is a weightless finishing spray for all coat types that will give a shine and radiance to your dogs coat worthy of any champion show dog. 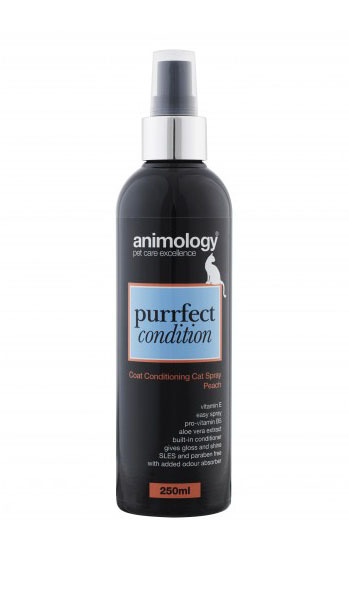 Feline Great, by Animology, is a mild and gentle shampoo, specifically formulated for cats, with aloe vera extract to soothe and protect the skin andpro-vitamin B5 to nourish the coat. Helps to keep your cat’s coat beautifully clean, conditioned and healthy. 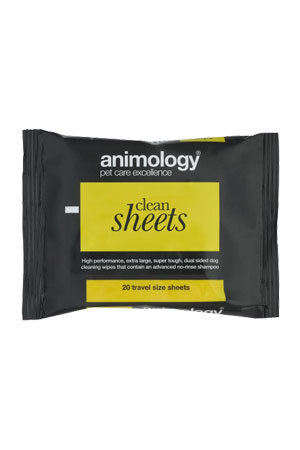 Animology Clean Sheets are a high performance, super tough dual sided dog cleaning wipes designed to be the ultimate pet wipe. With two different surfaces, a rough side to loosen dirt and a smooth side to clean, these extra tough wipes are lint free to prevent bits of dirty wipe breaking off and getting tangled in the dogs coat.